The loss of a single tooth can have a negative impact on your oral and overall health, so when you experience advanced tooth loss, this impact is even more severe. You don’t have to live with an incomplete smile that limits your diet and impacts your confidence in professional and social settings. Instead, your trusted dentist in Austin, Candace Bruno, DMD, can help you recreate a beautiful smile. Using custom-crafted partial or full dentures, Dr. Bruno and her team will have you smiling again in no time. Call our team to get started with your personalized tooth replacement plan today. 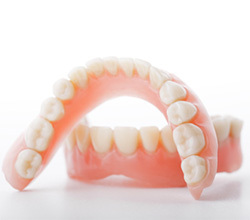 You may hear partial dentures referred to simply as partials. These tooth replacement prosthetics are used to fill in gaps in your smile. Like a puzzle piece, they snap into place recreating your natural look and function. A partial uses a gum-colored base material to support numerous replacement teeth. 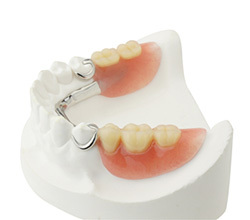 Clasps are then used to hold the partial denture in place anchored to surrounding teeth. A full set of dentures is similar to partial dentures. They’re crafted using a base material to support the entire row of replacement teeth. Because there are no surrounding teeth to provide support for a full denture, the base will be molded to fit against the gums. When properly fitted, the suction between the denture and gum line will hold the prosthetic in place. To improve stability, some people prefer to use a small amount of denture adhesive. Don’t wear your denture for a full day as soon as you get it. Instead, wear the denture for an hour or two at a time. Then, give yourself some time to rest. To get used to the way your denture will feel when you talk, try singing or reciting tongue twisters. This will help you adjust to the fit of your denture and get used to pronouncing a variety of words. Never sleep with your denture in place. This can put unnecessary strain on your gum and bone tissue, and unconscious grinding and clenching can damage the prosthetic. Take care of your denture properly. Be sure to brush your denture between meals and before bed. Always rinse your prosthetic with cool water and store the denture in cold water or denture solution overnight. 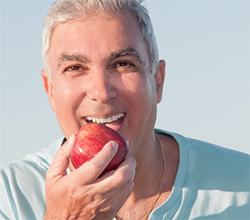 If you’re looking for added stability and longevity and you’re not worried about spending some extra time and resources to get these results, dental implant supported dentures may be the best option for you. These treatment options use two to six dental implant posts to mimic tooth roots, providing natural looking and feeling support for partial or full dentures.